Therapeutic exercise is defined as the systematic performance or execution of planned physical movements, postures, or activities intended to: 1) remediate or prevent impairments, 2) enhance function, 3) reduce risk, 4) optimize overall health, and 5) enhance fitness and well- being [1American Physical Therapy Association. Guide to Physical Therapy Practice. Phys Ther 2002; 81(1): 9-744.]. Therapeutic exercise has demonstrated its effectiveness for patients across broad areas of practice such as neurological, musculoskeletal, and cardiopulmonary conditions [2Taylor NF, Dodd KJ, Shields N, Bruder A. Therapeutic exercise in physiotherapy practice is beneficial: a summary of systematic reviews 2002-2005. Aust J Physiother 2007; 53(1): 7-16. [http://dx.doi.org/10.1016/S0004-9514(07)70057-0] [PMID: 17326734] -4Smidt N, de Vet HC, Bouter LM, et al. Effectiveness of exercise therapy: a best-evidence summary of systematic reviews. Aust J Physiother 2005; 51(2): 71-85. [http://dx.doi.org/10.1016/S0004-9514(05)70036-2] [PMID: 15924510] ]. It is the cornerstone of physical therapy clinical practice and, in turn, makes up forty percent (40%) of government reimbursements for physical therapy [5Ciolek DE, Hwang WC. CY 2008 Outpatient Therapy Utilization Report Medicare. In: Federal Healthcare Organization. Baltimore, MD: STATS Task Order 2010., 6Kandilov A, Lyda-McDonald B, Drozd EM. Developing outpatient therapy payment alternatives (DOTPA): 2007 Utilization Report. Research Triangle Park, NC: RTI International 2009.]. Despite therapeutic exercise’s high utilization and demonstrated usefulness, inconsistent clinical outcomes remain for several commonly treated conditions within the scope of physical therapy [2Taylor NF, Dodd KJ, Shields N, Bruder A. Therapeutic exercise in physiotherapy practice is beneficial: a summary of systematic reviews 2002-2005. Aust J Physiother 2007; 53(1): 7-16. [http://dx.doi.org/10.1016/S0004-9514(07)70057-0] [PMID: 17326734] , 7Osterås H, Torstensen TA. The dose-response effect of medical exercise therapy on impairment in patients with unilateral longstanding subacromial pain. Open Orthop J 2010; 4: 1-6. [http://dx.doi.org/10.2174/1874325001004010001] [PMID: 20148093] ]. Reported clinical and research variability in the effectiveness of exercise for certain conditions such as osteoarthritis of the knee, total hip arthroplasty, and shoulder impingement syndrome may not be due to the effect of therapeutic exercise on that condition. Rather, inconsistent effects may be due to the lack of appropriate intensity of the exercise program [2Taylor NF, Dodd KJ, Shields N, Bruder A. Therapeutic exercise in physiotherapy practice is beneficial: a summary of systematic reviews 2002-2005. Aust J Physiother 2007; 53(1): 7-16. [http://dx.doi.org/10.1016/S0004-9514(05)70036-2] [PMID: 15924510] , 7Osterås H, Torstensen TA. The dose-response effect of medical exercise therapy on impairment in patients with unilateral longstanding subacromial pain. Open Orthop J 2010; 4: 1-6. [http://dx.doi.org/10.2174/1874325001004010001] [PMID: 20148093] , 8Bertocci GE, Munin MC, Frost KL, Burdett R, Wassinger CA, Fitzgerald SG. Isokinetic performance after total hip replacement. Am J Phys Med Rehabil 2004; 83(1): 1-9. In order for an exercise and/or exercise program to be effective, an appropriate intensity is required to trigger the expected histological and physiological response. Intensity of an exercise is determined by its dose, of which two defining parameters are exercise resistance and number of repetitions performed [9Slade SC, Keating JL. Exercise prescription: a case for standardized reporting. Br J Sports Med 2011; 46(16): 1110-3. [http://dx.doi.org/10.1136/bjsports-2011-090290] [PMID: 22089077] -13Rhea MR, Phillips WT, Burkett LN, et al. A comparison of linear and daily undulating periodized programs with equated volume and intensity for local muscular endurance. J Strength Cond Res 2003; 17(1): 82-7. [PMID: 12580661] ]. To determine the appropriate resistance and repetitions, several methods and tests can be applied. For healthy subjects, the proper resistance is commonly based on the establishment of one repetition max (1RM). 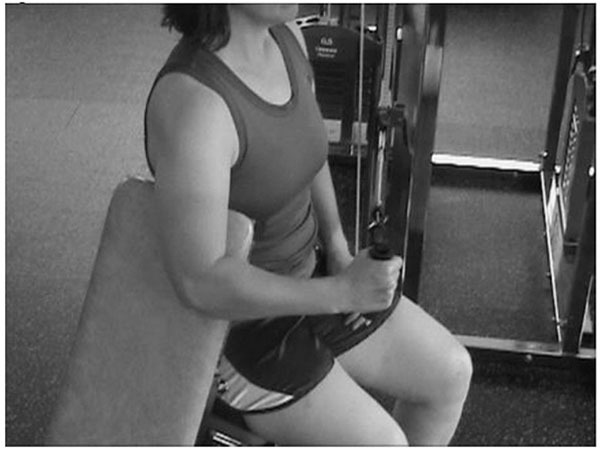 The procedure to establish a dynamic 1RM for an exercise requires multiple muscle contractions close to 1RM. After establishing 1RM, sub-maximal resistance levels can be established for healthy subjects by using existing reference tables and equations. Many factors influence the relationship between 1RM and sub-maximal intensity levels such as: overall training status, specificity of training status, genetic factors, gender, exercise specificity, type of muscle action, execution speed, and presence of disease or injury. Testing close to 1RM also requires a certain level of familiarity with the exercise and training status for safety. Therefore, it may be inappropriate to develop even a healthy subject’s training program based solely on the testing of 1RM. Further, a clinical setting involves injured or diseased tissue that may not tolerate the use of 1RM due to further risk of tissue injury or increased symptoms [14McArdle W, Katch F, Katch V. Essentials of Exercise Physiology. 3rd ed. Philadelphia, PA: Lippincott CO 2006.]. An alternate tool is the evaluation of the clinical manifestation of muscle fatigue, to which central and peripheral factors contribute. In healthy subjects, the major source of fatigue appears to be within the muscle fiber itself [15Binder-Macleod SA, Snyder-Mackler L. Muscle fatigue: clinical implications for fatigue assessment and neuromuscular electrical stimulation. Phys Ther 1993; 73(12): 902-10. [PMID: 8248298] ]. A study by Braun [16Kent-Braun JA. Central and peripheral contributions to muscle fatigue in humans during sustained maximal effort. Eur J Appl Physiol Occup Physiol 1999; 80(1): 57-63. [http://dx.doi.org/10.1007/s004210050558] [PMID: 10367724] ] indicates that intramuscular factors contributed 80% to the muscle fatigue with the remainder being attributable to central nervous system factors. A wide variety of definitions exist for muscle fatigue. According to Bigland-Ritchie and Sogaard, “to circumvent this limitation, most investigators invoke a more focused definition of muscle fatigue as an exercise-induced reduction in the ability of muscle to produce force or power whether or not the task can be sustained [17Bigland-Ritchie B, Woods JJ. Changes in muscle contractile properties and neural control during human muscular fatigue. Muscle Nerve 1984; 7(9): 691-9. [http://dx.doi.org/10.1002/mus.880070902] [PMID: 6100456] , 18Søgaard K, Gandevia SC, Todd G, Petersen NT, Taylor JL. The effect of sustained low-intensity contractions on supraspinal fatigue in human elbow flexor muscles. J Physiol 2006; 573(Pt 2): 511-23. [http://dx.doi.org/10.1113/jphysiol.2005.103598] [PMID: 16556656] ].” Enoka reports, “a critical feature of this definition is the distinction between muscle fatigue and the ability to continue the task. Accordingly, muscle fatigue is not the point of task failure or the moment when the muscle becomes exhausted. Rather, muscle fatigue is a decrease in the maximal force or power that the involved muscles can produce, and it develops gradually soon after the onset of the sustained physical activity [19Enoka RM, Duchateau J. Muscle fatigue: what, why and how it influences muscle function. J Physiol 2008; 586(1): 11-23. [http://dx.doi.org/10.1113/jphysiol.2007.139477] [PMID: 17702815] , 20Fulco CS, Lewis SF, Frykman PN, et al. Muscle fatigue and exhaustion during dynamic leg exercise in normoxia and hypobaric hypoxia. J Appl Physiol 1996; 81(5): 1891-900. Fatigue can be evaluated through several volitional and non-volitional means. Changes in EMG and torque output can be used as measurements of fatigue. Tests are very specific to the muscle group tested, the type of muscular contraction, the velocity of the movement, the movement range, and the equipment utilized [21Saey D, Troosters T. Measuring skeletal muscle strength and endurance, from bench to bedside. Clin Invest Med 2008; 31(5): E307-11. [PMID: 18980724] ]. Equipment requirements and limitations on testing functional movement patterns may make this impractical in a clinical setting. 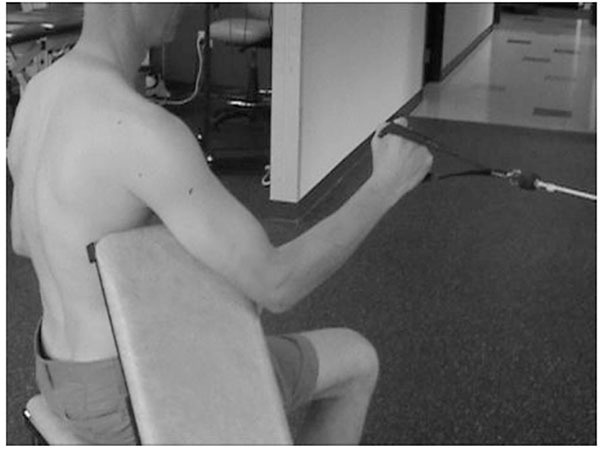 Tests relying on torque output may not take into consideration changes in a movement pattern that may occur prior to muscular exhaustion [22Udermann BE, Mayer JM, Graves JE, Murray SR. Quantitative assessment of lumbar paraspinal muscle endurance. J Athl Train 2003; 38(3): 259-62. [PMID: 14608437] ]. With these limitations established, how does a clinician ascertain the appropriate dose of dynamic exercises? In the 1960’s, Oddvar Holten developed the concept of Medical Exercise Therapy (MET), which promotes a submaximal testing procedure. The testing procedure determines the resistance based on the goal repetitions and the use of a theoretical curvilinear relationship between repetitions and percent of 1RM to guide the testing. In order to establish the exercise dose, the patient is asked to complete, with a given resistance, as many repetitions as possible to fatigue. It has been reported that muscle fatigue in the upper extremities may result in diminished proprioception and kinesthesia [23Henry TJ, Lephart SM, Giraldo J, Stone D, Fu FH. The effect of muscle fatigue on muscle force couple activation of the shoulder. J Sport Rehabil 2001; 10: 246-56., 24Voight ML, Hardin JA, Blackburn TA, Tippett S, Canner GC. The effects of muscle fatigue on and the relationship of arm dominance to shoulder proprioception. J Orthop Sports Phys Ther 1996; 23(6): 348-52. [http://dx.doi.org/10.2519/jospt.1996.23.6.348] [PMID: 8727014] ], which leads to a decline in quality of movement. A decline in the quality of movement is considered one of the first observational clinical signs of local neuro-muscular fatigue and may even occur prior to the patient’s perception of fatigue [25Grimsby O, Rivard J. Science, theory in orthopaedic manual physical therapy. Taylonville, UT: The Academy of Graduate Physical Therapy Inc 2008; vol. 1: p. 358.]. Muscle fatigue may also be observed as a change in execution speed, and/or an alteration in movement range, and/or the appearance of accessory muscle contractions and movements. In this scenario, it is imperative for clinicians to effectively identify fatigue to prevent further injury and to appropriately dose the therapeutic exercise. As shown in Fig. (1 ), the procedure for participants started with an assessment of eligibility. Screening included a questionnaire for past medical history related to upper quarter bilateral symptoms, age, gender, height in centimeters and dexterity. The physical exam included evaluation for posture, upper motor neuron dysfunction, cervical active range of motion, shoulder active range of motion, thoracic active range of motion, and shoulder girdle active range of motion deficits. The participants were also tested for grip strength in kilograms, isometric shoulder internal and external rotation strength in kilograms, and weight in kilograms. Each participant was asked to perform four (4) isometric maximum strength tests: right shoulder external rotation, right shoulder internal rotation, left shoulder external rotation and left shoulder internal rotation. Each test involved a series of three (3) consecutive repetitions of isometric strength assessment with resistance at the wrist in neutral and shoulder in 30 degrees of flexion and 30 degrees of abduction. The maximal score was used as the measurement. Following isometric testing, each participant was placed in a sitting position on a multi-purpose bench with the elbow supported and the shoulder in an open packed position. The starting position included the elbow at ninety (90) degrees of flexion and the wrist in neutral. The pulley and bench were set up in a manner to allow for perpendicular angles of both the pulley rope with the humerus and the pulley rope with the forearm at mid-range. This allowed the rope to remain in the appropriate plane of movement. Resistance was provided by the STEENS pulley at approximately fifteen (15) to fifty (50) percent of the maximum isometric strength assessed during baseline testing. Each participant was then asked to complete active shoulder external (Fig. 2 ) or internal (Fig. 3 ) rotation to exhaustion. The screening resistance was adjusted to allow for an adequate number of repetitions to be assessed in the future testing session. Each participant was instructed in the testing procedures and given a testing appointment three weeks later to allow for full recovery from the baseline testing. Descriptive analyses, including frequency for categorical variables and calculation of median and range for continuous variables were calculated for all forty-four (44) subjects. Due to the continuous data and multiple physical therapist raters used in this study, intraclass correlation coefficients (ICCs) were used for the reliability analysis with a confidence interval (CI) of 95%. We used l ICC form (2,1) for the calculation of the intraclass correlation coefficients. This single rating model allows for demonstrating confidence that trained physical therapists in a clinical setting would score a test equally [26Portney L, Watkins M. Foundations of Clinical Research. 2nd ed. Upper Saddle River, New Jersey: Prentice-Hall, Inc. 2000.]. The guidelines used for interpretation of the ICCs were as follows: 0.00 to 0.25 indicated little if any correlation; 0.26 to 0.49 indicated low correlation; 0.50 to 0.69 indicated moderate correlation; 0.70 to 0.89 indicated high correlation; and .090 to 1.00 indicated very high correlation [27Munro BH. Statistical Methods for Health Care Research. Philadelphia, PA: Lippincott Williams & Wilkins 2005.]. All data were analyzed using SPSS 20.0 (SPSS Inc, Chicago, Illinois). Sustained aberrant changes in movement patterns are the clinical signs of local muscular fatigue. This study investigated the inter-rater reliability of detecting changes in movement patterns due to local neuro-muscular fatigue. Six practicing physical therapists simultaneously observed a total of one hundred seventy-six (176) shoulder tests. A single-measures ICC (2,1) model was used to calculate single-rater reliability and the observations were performed in a live setting. This allowed for generalization to the clinical setting where a physical therapist would likely score a single test. Moderate correlations were found for all four (4) tests. These results compare well with other studies to determine inter-rater reliability of observational movement tests for upper extremities. McClure et al. [28McClure P, Tate AR, Kareha S, Irwin D, Zlupko E. A clinical method for identifying scapular dyskinesis, part 1: reliability. J Athl Train 2009; 44(2): 160-4. [http://dx.doi.org/10.4085/1062-6050-44.2.160] [PMID: 19295960] ] investigated the inter-rater reliability of six (6) raters (3 pairs) to classify shoulder dyskinesia through videotaped analysis and limited visual assessment in a live setting. The researchers found moderate inter-rater reliability with an average weighted Kappa .57 for live raters and .54 for those viewing videotape. They classified the scapular motion as normal, subtle dyskinesis, or obvious dyskinesis. McClure et al. felt their findings represented satisfactory reliability of clinicians working in a clinical setting. Kibler et al. [29Kibler WB, Uhl TL, Maddux JW, Brooks PV, Zeller B, McMullen J. Qualitative clinical evaluation of scapular dysfunction: a reliability study. J Shoulder Elbow Surg 2002; 11(6): 550-6. 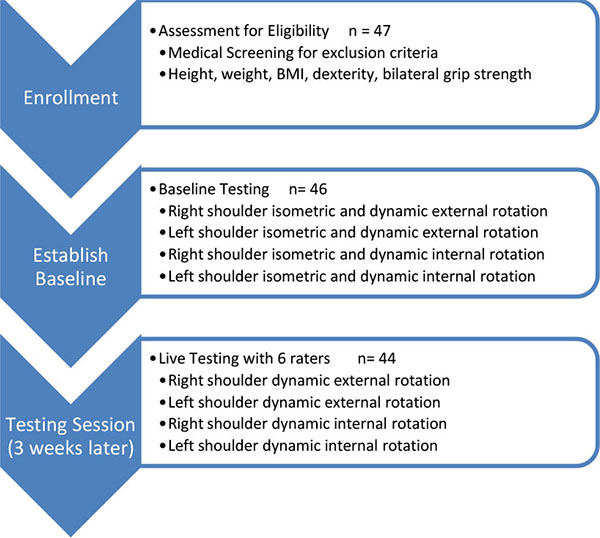 [http://dx.doi.org/10.1067/mse.2002.126766] [PMID: 12469078] ] also used a visually based system for assessing shoulder dyskinesia and reported Kappa coefficients of .42 and .32 for inter-rater reliability among physical therapists and physicians. They concluded reliability was sufficient, with refinement, to allow utilization of this assessment in a clinical setting. Similar results have been reported in lower extremity studies. Davis et al. 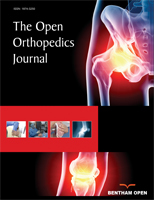 [30Davis AM, Bridge P, Miller J, Nelson-Wong E. Interrater and intrarater reliability of the active hip abduction test. J Orthop Sports Phys Ther 2011; 41(12): 953-60. [http://dx.doi.org/10.2519/jospt.2011.3684] [PMID: 22030553] ] evaluated inter-rater and intra-rater reliability of active hip abduction. They noted that previous research used movement observation as an appropriate assessment tool for clinicians. Their study used a four point assessment scale and demonstrates an inter-rater reliability ICC (2,1) of .70 (0.56, 0.84). The observational tests reported in the aforementioned studies all used limited scoring categories ranging from two (2) to four (4). The investigators could identify limited studies which used a larger scoring range and quality of movement as scoring parameters. Moreland et al. [31Moreland J, Finch E, Stratford P, Balsor B, Gill C. Interrater reliability of six tests of trunk muscle function and endurance. J Orthop Sports Phys Ther 1997; 26(4): 200-8. [http://dx.doi.org/10.2519/jospt.1997.26.4.200] [PMID: 9310911] ] investigated the inter-rater reliability of six (6) trunk tests of which three were dynamic endurance tests. Three (3) raters tested thirty-nine (39) subjects during three (3) testing days. They found acceptable inter-rater reliability for dynamic abdominal endurance test (ICC .59), dynamic abdominal endurance test limited to 75 repetitions (ICC .89), and extensor dynamic endurance (ICC .78). The tests were controlled for speed and technique, and tests were stopped when pain occurred. It appeared the tests were dictated by task failure or exhaustion, rather than by subtle changes in movement pattern as is the case in this study. Although 1) movement analysis is an integral part of the skill set of physical therapists [32Hickey BW, Milosavljevic S, Bell ML, Milburn PD. Accuracy and reliability of observational motion analysis in identifying shoulder symptoms. Man Ther 2007; 12(3): 263-70. [http://dx.doi.org/10.1016/j.math.2006.05.005] [PMID: 16973403] ], 2) physical therapists believe they are skilled at accurately assessing movement through observation [33Bernhardt J, Bate PJ, Matyas TA. Accuracy of observational kinematic assessment of upper-limb movements. Phys Ther 1998; 78(3): 259-70. [PMID: 9520971] ], 3) the six (6) physical therapists functioning as raters were experienced therapists and 4) education was provided in different formats to optimize learning, no assessment of the raters was performed in determining how accurately they could recognize a change in movement patterns. Only one therapist functioning as a rater was familiar with the assessment method prior to the study and uses it in daily clinical practice. The raters were in close proximity to each other. Although the raters were clearly instructed not to interact with each other during the testing sessions, the setting did not exclude potential visual and auditory interaction. This study used a design of six (6) physical therapist raters simultaneously evaluating change in movement patterns in a live dynamic exercise setting. Videotaped subjects with an expert consensus on when actual movement changes occurred and a pre-study competency assessment of the raters may have increased the reliability. The current study provides support for the medical exercise therapy framework to establish appropriate dose of an exercise in a clinical setting. Practical and clinical limitations of available protocols may prevent therapists from establishing appropriate exercise intensity. In addition, a study from Haas et al. [34Haas R, Maloney S, Pausenberger E, et al. Clinical decision making in exercise prescription for fall prevention. Phys Ther 2012; 92(5): 666-79. [http://dx.doi.org/10.2522/ptj.20110130] [PMID: 22228609] ] investigated the clinical decision making in exercise prescription for fall prevention. It revealed evidence of dissonance between prescribing what was thought to be a correct dose on the basis of physiological considerations and prescribing based on a therapist’s perception of a patient’s adherence. The reliable observation of clinical fatigue allows the clinician to determine the appropriate exercise intensity by ensuring the correct resistance for the targeted amount of repetitions. For example, to increase muscular strength the amount of repetitions should be low and the resistance should be high. The results for right and left shoulder external rotation for two of the study participants are presented in Table 4. Participant A performed both exercises with a resistance of 1.75kg. The raters indicated a change in movement pattern occurred between 4 and 7 repetitions for right shoulder external rotation and between 5 and 7 for left shoulder external rotation, while exhaustion occurred at 14 and 12 repetitions respectively. Although variability exists at which point fatigue was observed in Participant A, based on the test results, all physical therapists using the medical exercise therapy framework would prescribe a similar exercise dose to obtain the physiological response for gaining muscular strength. Participant B performed external rotation with 2.0kg. The raters indicated a change in movement pattern occurred between 15 and 20 repetitions for right shoulder external rotation and between 12 and 17 for left shoulder external rotation, while exhaustion occurred at 37 and 32 repetitions respectively. Physical therapists would prescribe a similar exercise dose if the above scenario occurred in the clinic. While exhaustion is easier to identify in a clinical setting, it also increases the risk of further injury or increase of pain. Both examples for Participant A and Participant B demonstrate the difference between the number of repetitions for the occurrence of aberrant movement patterns and exhaustion. Traditional training protocols result in high metabolite accumulation and associated discomfort, pain, and exhaustion. Recent reports from Folland et al. and Izquierdo et al. suggest that similar gains can be achieved with lower levels of training stimuli with an appropriate level of fatigue [35Folland JP, Irish CS, Roberts JC, Tarr JE, Jones DA. Fatigue is not a necessary stimulus for strength gains during resistance training. Br J Sports Med 2002; 36(5): 370-3. [http://dx.doi.org/10.1136/bjsm.36.5.370] [PMID: 12351337] , 36Izquierdo M, Ibanez J. Differential effects of strength training leading to failure versus not to failure on hormonal responses, strength, and muscle power gains. Appl Physiol 2006; 100(5): 1647-56. [PMID: 16410373] ]. Therefore, we recommend that physical therapists prescribe an exercise dose based on the establishment of clinical fatigue.